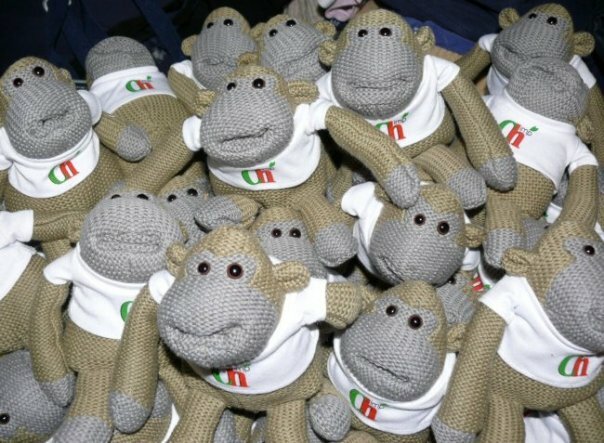 It seems that I now have 59 of the PG-Tips monkeys. That doesn’t include Sidekick, the trusty little monkey of the same family who travels the world with me in the pocket of my rucksack. To get 59 monkeys, I have had to buy 9,440 tea bags at a cost of about 165 quid. The tea alone takes up a few square metres of space. But hey! They are handmade, and in England too, that’s got to be something right? For those who have been lucky enough to avoid my monkey obsession, these are the little monkeys being given away with special packs of PG-Tips but he was originally not a PG-Tips monkey, he escaped from the long since failed OnDigital TV Adverts just after they became ITV Digital and crashed horribly, taking Monkey with them. Monkey became a cult advertising hero and for the first time I can think of, another company bought the rights to him and ressurected an advertising campaign for a completely different product. The OnDigital monkeys became quite valuable, selling on eBay for about 100 quid each and for a short time, they made the Sidekick mini-monkeys but that stopped due to licencing problems I think. I have one of those and Carolyn has his only known relative. For more, and watch the advert, it’s great 🙂 You can find the older adverts on Youtube. Isn’t he cute! Can you see why I need 60 of them now? I am going to try and get one of those fairground claw machines for them to live in. http://pgtipsmonkeyfanclub.wordpress.com/ if u wanna come along id apreciete it!